Orientation is the first step in your collegiate career. 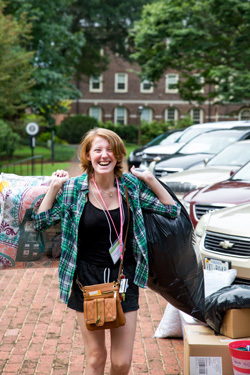 Student Life has designed an orientation program to familiarize new students with the Sweet Briar campus and community while giving you time to unpack, relax and connect with classmates. New students will be introduced to academic life and expectations, and participate in first-year traditions. This is also the time to experience co-curricular and recreational opportunities that will be available during the next four years. In the fall, new students arrive on Saturday, Aug. 17, 2019, before classes begin the following Thursday. Welcome to Sweet Briar! The campus community is excited for you to join our Vixen family. Please note that unless you are an athlete or an international student, your move-in period will be Saturday, Aug. 17, from 8:30 a.m. – noon. After you move in, there will be many educational sessions and social events to help you acclimate to college life. These sessions are mandatory and your attendance is expected at each session. Please contact the Office of Student Life at 434-381-6134 if you have any questions. Fall Athletes: If you are a fall athlete participating in pre-season, your move-in date will be Wednesday, Aug. 14, from noon to 2 p.m. in the Fitness and Athletics Center lobby. Please note that we won’t provide lunch that day. International Students: If you are an international student, your move-in date will be Friday, Aug. 16. If you are not able to arrive on that day, please plan to check-in on Aug. 17, between noon and 2 p.m. in the Office of Student Life, located on 2nd floor of Prothro. Spring orientation is shorter. New and transfer students arrive in January (TBA) before classes begin on Tuesday, Jan. 14.